New Star Cleaner for Chucks (left), a chucks cleaning kit containing a washcloth applicator, a small hard bristle brush, Star Cleaner, and liquid soap. 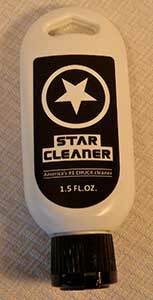 Purchase Star Cleaner for Chucks. 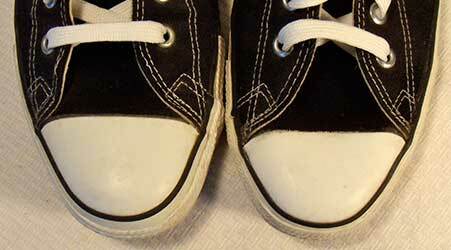 If you like to keep your chucks looking new, there is good news. 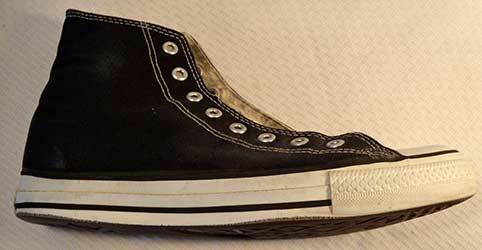 A new product, Star Cleaner for Chucks, has just been released. 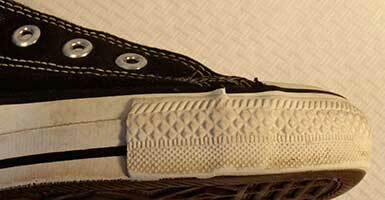 This cleaner is especially good at restoring the toecaps on your chucks so that they look like new again. How often has this happened to you? You have just bought a new pair, but after a few days wearing them, the toecaps have gotten a little scuffed and dirty while the rest of the shoe still looks brand new. With this new cleaner, just a tiny dab of it will restore the toe caps to like new condition, clean and opaque white looking once again. 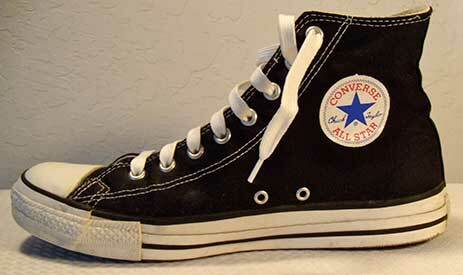 Best of all, this product can help you restore a worn, well used pair of chucks to almost new condition. When we first heard about this product, we tested it out on a pair of worn black high tops. 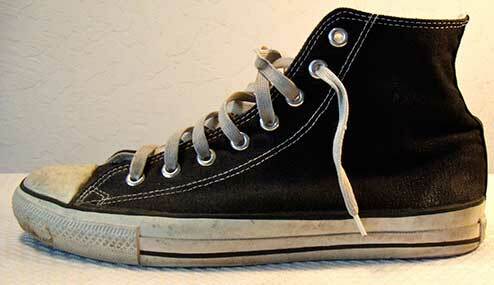 We found a pair of chucks that had gotten shoved aside in the closet. On examination, they still had a lot of wear left in them, plenty of tread on the outer soles and no noticeable holes in the inner canvas lining. 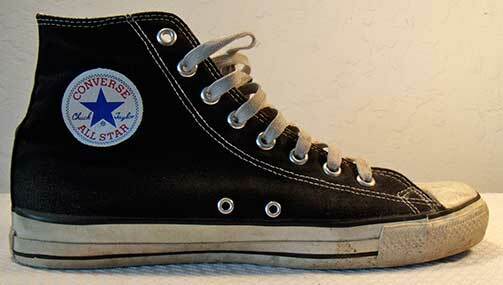 So here was a pair around twenty years old, classic Made in USA chucks with all rubber outer soles. Wouldn't it be great to wear these sneakers again? Even better if they looked new again. 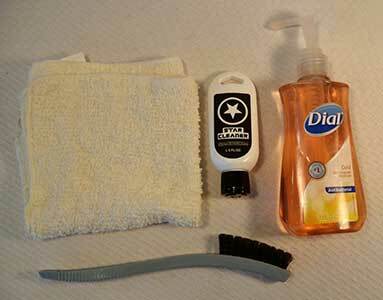 And this was a good way to see how the Star Cleaner product performed against traditional methods of cleaning chucks, using soap and water or other household cleaners. Inside patch and outside views of the right black high top before its cleaning. 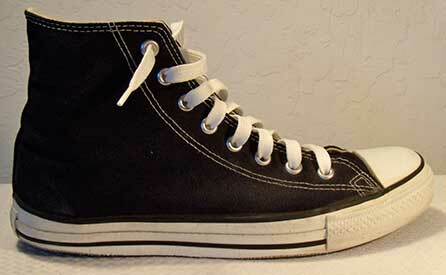 Here are some pictures of the chucks that were used in the test. Inside patch and outside views of the left black high top before its cleaning. 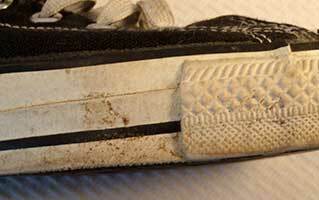 Below are some close-up photos of dirt stains on the toe guards and outer foxing. Dirt and stains on the toe guards and outer foxing. The hardest thing to clean on older pairs of chucks has always been the toe caps. The dirt and mottling gets worked in, and traditional cleaners can't restore them to a new, clean-looking state. Toecaps on the black high tops before cleaning. Dirt can collect on the canvas uppers. The best and only way you should clean that off is with a damp cloth. You want to avoid soaking the canvas uppers in water. You don't want to mess up all the work your feet did to make the canvas conform to them. It's a simple matter to wipe them with the damp cloth, and dry them with a towel, or let them air dry. Dirt on the canvas before cleaning. Below are the results from the soap and water cleaning. You can see that a lot of the dirt could be removed, but not the hard to get at dirt, even with the use of a brush. Soap and water was able to get much of the dirt off, but not all, even though the scrub brush was used. 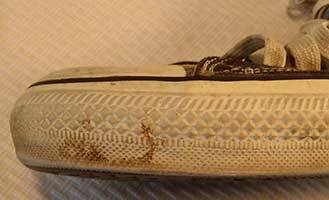 The front of the toe guard and the toecap, which had the most ground in dirt, fared somewhat poorly with soap and water. You could get some of the dirt but not all. The brush doesn't work on the toe caps; all it would do is scratch the finish if you pressed down too hard. Soap was unable to loosen the well-ground-in dirt in the grooves of the toe guards. Soap did work well on the smooth outer foxing. Soap and water was not particularly good at cleaning the toe caps and toe guards. Now it was time to use the Star Cleaner product. This product is at its best cleaning and restoring toe caps. All that mottling and dirt was removed, and it was good getting most of the dirt and stain removed from the toe guards on this pair of chucks. 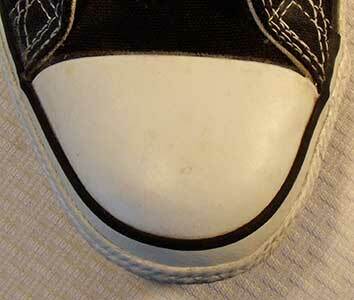 The toe cap after a cleaning with Star Cleaner. 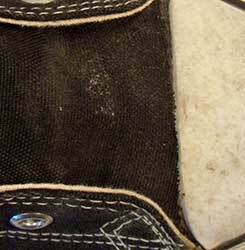 The toe guard after a cleaning with Star Cleaner. For our cleaning, we removed the shoelaces. The easiest thing to do is replace them with new ones. 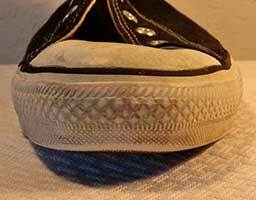 You can clean them in the washing machine, but you will still have dirt marks on them from where they went through the metal eyelets on your chucks. 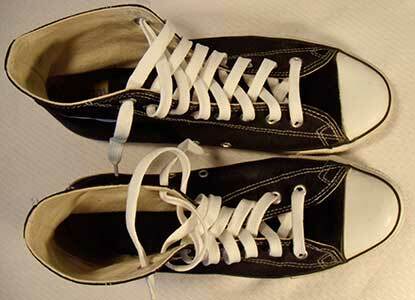 For white shoelaces, wash them with your other whites using bleach. For colored laces, wash them in a dark color load of wash. 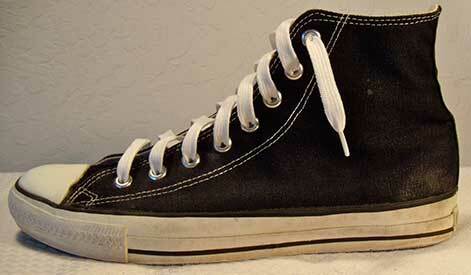 The photos below show our newly cleaned pair of black high tops. The Star Cleaner was quite successful in making them look nearly new again. A new pair of white shoelaces finished the makeover. 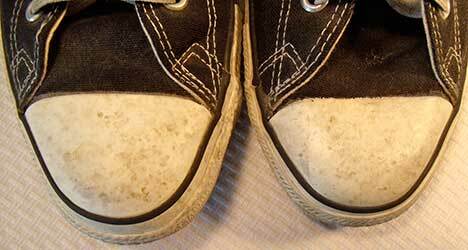 Our right shoe after using Star Cleaner. 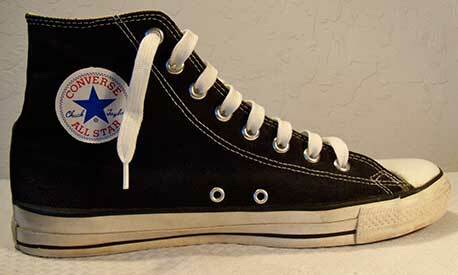 The completely restored pair of black high tops. Star Cleaner and a new pair of shoelaces made this pair look almost brand new. Inside patch and outside views of the right black high top after its cleaning. Inside patch and outside views of the left black high top after its cleaning. 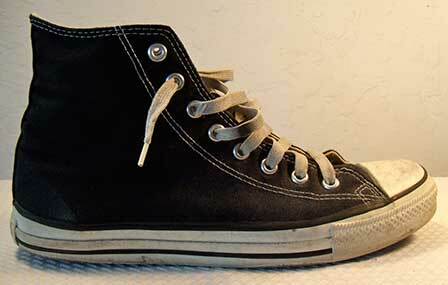 Top view of our restored pair of black high top chucks and a close-up of the restored toe caps. You can purchase a container of Star Cleaner for Chucks right here at The ChucksConnection online store. Anyone who likes keeping their chucks looking new should have this product on hand. 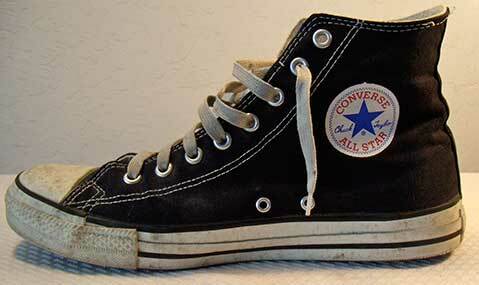 An application of the cleaner and a new pair of shoelaces will do wonders for that older pair of chucks you would like to restore. Some other tips when using Star Cleaner. Always use it in a well ventilated area. Always apply it from an applicator. Do not put it directly on the shoe and keep it off the canvas uppers. Use it sparingly: a little goes a long way! See also Tips on Caring for Chucks.